Featuring a unique combination of a highly responsive engine tuned for flexibility, a nimble chassis fitted with dynamic suspension, and standard Kawasaki Quick Release 28-Liter Saddlebags and hand guards, the Versys® 1000 LT offers maximum riding enjoyment across a wide variety of street riding situations, especially on twisty roads. Created as the long-awaited big brother of Kawasaki’s mid-size any-road street surfer, the new Versys 1000 is designed to enable the greatest riding enjoyment in the widest variety of street riding situations. Whether riding solo or two-up, around the corner or around the globe, its unique combination of a highly responsive In-Line Four engine tuned for flexibility will have your grinning in your helmet. On any-street, the new Versys 1000 offers maximum riding enjoyment. Solo or two-up, around the corner or around the globe, a unique combination of a highly responsive In-Line Four engine plus a nimble chassis is a recipe for riding fun. Add in the upright riding position and you have a package that is an ideal city roamer that really comes into its own on twisty mountain roads. WITH AN INSPIRING 1,043cc INLINE FOUR-CYLINDER ENGINE AND NIMBLE CHASSIS, THE VERSYS® 1000 LT IS SURE TO TAKE YOU ON AN UNFORGETTABLE ADVENTURE. 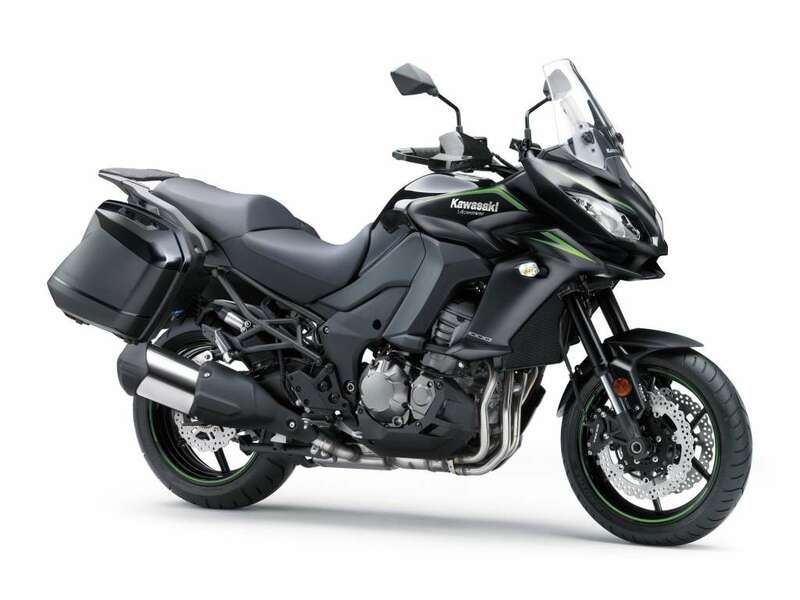 The Kawasaki Versys® family of motorcycles is designed for adventure-style touring. The award-winning lineup starts with the nimble, easy to maneuver Versys®-X 300 ABS motorcycle. The Versys-X 300 ABS was met with rave reviews when it was introduced to the public earlier this year. It is now returning with new color options, while retaining its adventure capability. The new colors for the 2018 Versys-X 300 ABS includes Metallic Spark Black/Metallic Flat Raw Graystone and Passion Red/Metallic Flat Raw Graystone. The Versys® 650 ABS and Versys® 650 LT motorcycles are capable machines designed for fun and comfortable riding. Known for Kawasaki’s torquey 650cc parallel twin engine and lightweight chassis, the Versys 650 LT has smooth handling and responsive feedback. It’s a capable motorcycle that sits nicely in the middleweight category, meeting a variety of riders’ needs. The Versys 650 LT models come standard with hand guards and saddlebags. The Versys 650 ABS and Versys 650 LT are both returning for 2018 with new color offerings in Metallic Flat Spark Black/Metallic Carbon Gray and Pearl Blizzard White/Metallic Spark Black. The Versys® 1000 LT rounds out the Versys family of motorcycles, offering the most powerful engine in the lineup, with premium suspension components. ABS is standard on all models along with accessories like saddlebags and hand guards. 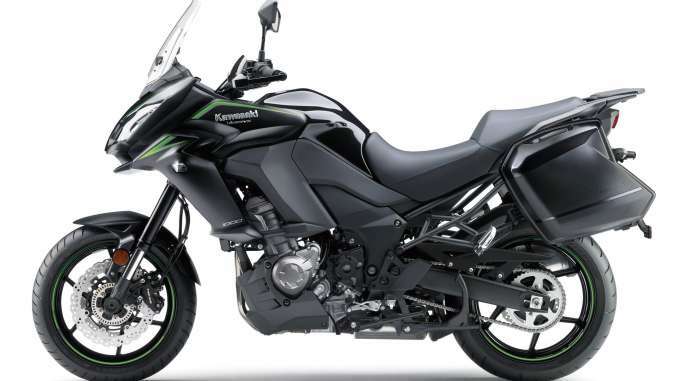 The Versys 1000 LT has been highly regarded by the media and customers for its immense performance, smooth maneuverability and the ability to eat up miles with ease. The Versys 1000 LT is returning in 2018 with a new color: Metallic Flat Spark Black/Metallic Spark Black. •Tuned to provide strong low and mid-range torque with a smooth power delivery. •An intoxicating intake howl contributes to the engine feel and allows riders to to enjoy the sound when accelerating. •Good over-rev characteristics so that power does not drop off suddenly at high rpm. •A secondary balancer, driven off a gear on the 6th web of the crankshaft, eliminates excess vibration. A certain amount of engine vibration was designed to be part of the bike’s character (vibration contributes to the feeling of acceleration, increasing linearly with rpm), so vibration was not totally eliminated. •Generator puts out 15.3 amps at 1,100 rpm to provide sufficient power for a full complement of accessories. •Flexible engine character means the Versys 1000 LT works just as well cruising along at low-rpm as it does being ridden more aggressively in the mid-high rpm range. •Downdraft throttle bodies provide air the shortest distance to the engine to help boost performance. While downdraft throttle bodies often use short intake funnels to maximize high-rpm performance, the Versys 1000 LT ‘s are longer to offer the best power characteristics for street riding excitement. •38mm throttle bores enhance low and mid-range response. •Oval sub-throttle valves are used to deliver extremely smooth response. The oval shape also helps keep the engine slim – important since the throttle bodies are positioned between the rider’s knees. •Denso long-type, 12-hole fine-atomizing injectors with tapered nozzle openings contribute to combustion efficiency. •Power delivery is quite linear and, thanks to FI settings, response is both quick and very smooth. Both characteristics facilitate control (especially for low-rpm maneuvers or when rolling the throttle on) and contribute to sport riding potential. •Large, oval-shaped connector pipes join exhaust headers 1-4 and 2-3. The reduced exhaust resistance results in an ideal exhaust flow, contributing to better performance at all rpm. •Under-engine pre-chamber contributes to a more centralized mass by enabling a smaller-volume silencer. •Single-side muffler offers lower weight than twin mufflers. •Using the rotational forces of the clutch hub and pressure plate, the clutch is forced together during acceleration (Assist function) so that fewer and lighter clutch springs can be used for a lighter feel at the lever. During high back-torque, such as when too low of a gear is selected during downshifting, the Slipper function allows some clutch slippage to help prevent engine lock-up, stalling and rear wheel hop. •Judder spring component helps prevent judder when the clutch is disengaged. •Gear ratios accommodate a wide range of riding situations, including sport riding, highway cruising, and riding fully loaded with passenger and luggage. •Short first gear facilitates moving off from a stop while fully loaded, while long third through sixth gears are suited to both sport riding and relaxed highway cruising. Chassis balance and suspension settings were selected to maximize rider enjoyment on the street. 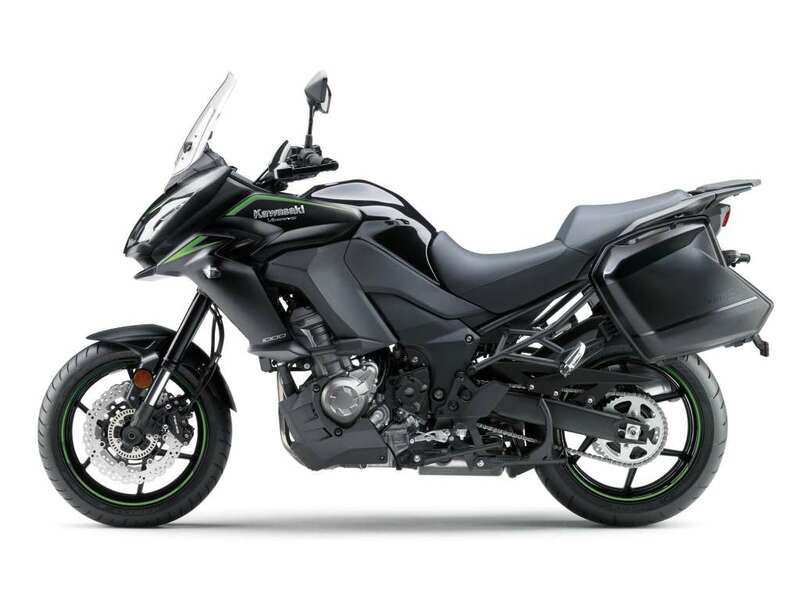 With its superb control and feedback, the Versys 1000 LT offers a high level of rider confidence in numerous street riding situations and accommodates a variety of riding styles. And because the Versys 1000 LT is intended to be used on a variety of streets where road imperfections are common, its long-travel suspension enables riders to cope with rough street conditions and allows the Versys 1000 LT to remain composed where bikes with stiffer, sportier set-ups would require a much slower pace. The relaxed, upright riding position offers a high level of machine control as well as a good vantage ahead. • Aluminium twin-tube frame design features frame beams that go over engine, allowing a narrow construction that is easy to grip with the knees. • Lightweight and highly rigid, the frame uses the engine as a stressed member. The frame contributes to handling, offering a firm, planted feeling, stability and light, nimble turning. • The frame is a 5-piece cast aluminium construction, consisting of steering stem, left and right main frames, and two cross pieces. The two main frame components have open C-shaped cross sections and were die-cast to ensure a smooth surface finish. • Reinforcing pipes join the engine hangers, offering increased chassis rigidity to suit the long-suspension configuration. • Rear sub-frame is steel pipe trellis unit that enables the Versys 1000 LT’s high payload. • Welds were strategically placed for a better appearance. • The frame uses 4 engine mounts. The upper rear crankcase mount and front cylinder mounts are rubber to help prevent vibration and provide excellent handling characteristics. •Standard center stand for utility and ease of maintenance. • Supporting the damping cylinder inside the fork inner tube allows a larger cylinder diameter to be achieved with a larger damping piston. The larger piston size contributes to a very composed suspension action. • Supporting the damping cylinder at the top adds rigidity to the cylinder, so its walls could be made thinner to help reduce weight in the fork assembly for a lighter steering feel. check valves: controlling either rebound or compression damping. However, when oil flow reverses direction, oil can flow through the valve unchecked during the instant it takes for the check valve to close completely, resulting in a temporary loss in damping force.) The reverse dampingforce assistance valves help to reduce this effect, enabling more consistent damping performance, which translates to smoother fork action. • The 27-degree steering angle contributes to a good balance of high-speed stability and a neutral handling character that facilitates sporty street riding. • The linkage is placed atop the swingarm for better mass centralization and to make room for the exhaust pre-chamber. • Fully adjustable, lay-down shock absorber is further away from the exhaust so that its operation will not be affected by exhaust heat. • Remote preload adjuster knob allows preload to be easily changed to suit tandem riding or fully-loaded luggage. • Free piston in shock separates gas and oil to enhance damping characteristics. • Dual 310mm front petal discs gripped by opposed 4-piston calipers offer strong stopping power with good brake feel. • At the rear a 250mm petal disc is gripped by a singlepiston caliper. • The high-spec ultra-compact lightweight BOSCH unit enables high-precision ABS performance. • Front brake hydraulic pressure is monitored to help reduce rear wheel lift. • ABS settings are designed to facilitate controlled braking in certain street riding situations. • The seat’s slim design and the knee grip characteristics of the tank provide freedom of movement, allowing the riders to change sitting position should they so choose. • Thick urethane padding increases comfort and contributes to a seat height that places the rider in a position of fun controllability. • The stepped shape of the seat also provides support for the rider when accelerating. • Footpegs are positioned low and forward, contributing to a spacious riding position. Rubber-mounted brackets and rubber-coated footpegs help reduce vibration reaching the rider. • The very natural, relaxed position offers the rider a high level of machine control. The upright riding position accommodates a variety of riding styles, broadening the spectrum of riding enjoyment and also offers a high level of comfort, a great benefit for touring. • When combined with the long-stroke suspension, the upright riding position and higher seat height offer a commanding view of the road ahead – especially advantageous when navigating city traffic. • Wide, large-diameter handlebar offers easy control, especially for low-speed maneuvering. Rubber mounts help reduce vibration for rider comfort. • Standard hand guards help deflect the wind, adding to rider comort. • Ergonomic grab bars provide comfortable passenger grips. • Adjustable windscreen has a stepless range of approximately 2.6 inches. Height can be adjusted without tools (using two knobs on the front of the screen) to suit rider preference. • Aggressive new upper cowl design provides a sporty image and excellent wind protection. Special air passages between the upper and side cowlings reduce air resistance to help deflect the wind, while a chin spoiler below the headlights creates downforce at higher speeds to enhance stability. • Air intake between the headlights at the bottom of the cowl routes fresh air into the cockpit to relieve the effect of negative pressure at higher speeds to help prevent helmet buffeting. • Saddlebag design is integrated with tail section and are large enough to hold a typical full-face helmet. • Similar in design to the Concours®14 mounts, the saddlebags can be easily removed and installed, plus there’s no supporting framework to detract from the motorcycle’s adventure style when they’re removed. • One-key system for the ignition and saddlebags is convenient. •A lightweight resin-construction rear carrier (12-pound maximum capacity) provides a solid platform for carrying items. • Large under-seat storage space has room for compact rain gear or other small items. •High capacity generator develops enough electricity to power a 45 watt accessory DC power outlet. 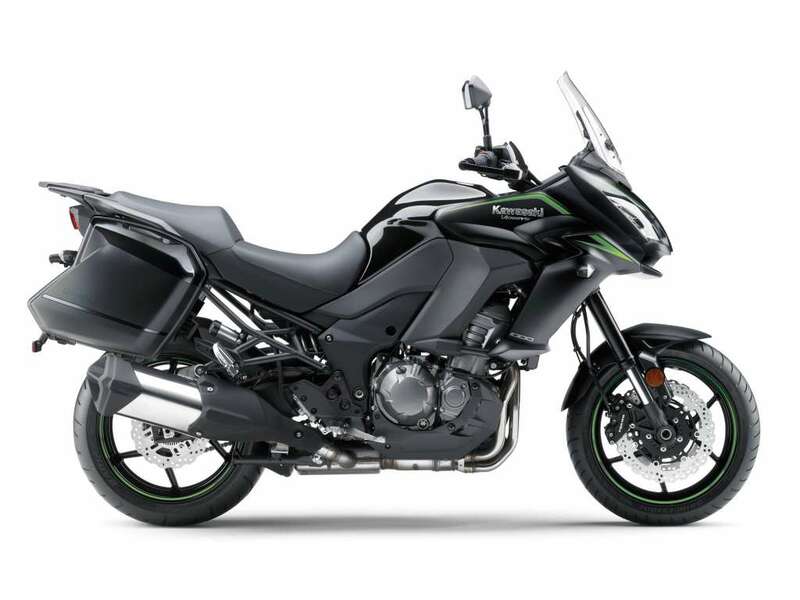 The Versys 1000 LT is loaded with the latest technological systems that Kawasaki has to offer. Its traction control system is the same as found on the flagship Ninja® ZX™-14R – more advanced even than that of the Ninja ZX-10R. Combined with two selectable Power Modes, this offers riders eight combinations covering a wide range of situations. smooth riding on slippery surfaces. for optimal traction. Mode 3 has higher sensitivity and controls ignition timing, fuel and air for ultrasmooth operation. •A switch on the left handlebar switch housing gives the rider the option to turn the system off.